Life Cycle Approaches include a wide variety of concepts, programs, tools, and data that range from qualitative (e.g., Life Cycle Thinking [LCT]) to quantitative (e.g., Life Cycle Assessment [LCA]) and from conceptual to pragmatic. Conceptual approaches are those that are more visionary, such as LCT, whereas pragmatic approaches are more tangible activities such as LCA. Some focus on resources and environmental features and others incorporate financial aspects (e.g., Life Cycle Costing [LCC]) and social information (e.g., Social Life Cycle Assessment [SLCA]). The focus of the approach also varies – that of products (e.g., Design for Environment) or that of materials and resources (e.g., sustainable supply-chain management). Several of these are well established, including (Environmental) Life Cycle Assessment (LCA), Environmental Product Declarations (EPDs), ecolabelling and Design for Environment (DfE), with supporting standards or guidelines and a large amount of application. Others are emerging or less developed and are not supported by international standards, as is the case with SLCA. Some Life Cycle Approaches, such as LCA, can be resource intensive. However, there is a shift underway that is allowing Life Cycle Approaches to be applied in more cost-effective and timely ways while still affording the benefits mentioned above. This group of concepts, programs, tools, and data and information are collectively described in this report as “taking a Life Cycle Approach,” and are illustrated in the NRT’s Life Cycle Approach Framework (see Figure 3). The framework contains key terminology; however, it is not meant to be a comprehensive list of Life Cycle Approaches. This section describes this framework, including the relationships among the different components and provides definitions for some of the most common approaches included in each. Concepts can be used to aid the decision-making process, or they can be used to provide a framework for developing and implementing a suite of Life Cycle Approaches. Qualitative data and information often help support and inform the use of LCT. The application of these concepts helps governments and businesses pinpoint existing tools or identify supporting programs they need to develop. Life Cycle Approaches include a wide variety of concepts, programs, tools, and data that range from qualitative (e.g., Life Cycle Thinking [LCT]) to quantitative (e.g., Life Cycle Assessment [LCA]) and from conceptual to pragmatic. Other examples of programs include ecolabelling, Green / Sustainable Procurement, Extended Producer Responsibility (EPR), LCM, Sustainable Supply Chain Management and EPDs. Programs can serve multiple functions. They can communicate the environmental impacts of a product, process, or system to customers (both individuals and businesses) in the form of ecolabels and EPDs. They can also be used to support the interventions of governments, as in the case of EPR, and those of businesses, as exemplified by DfE. EPR is the extension of a producer’s responsibility for a product to the post-consumer stage of a product’s life cycle.15 The responsibility can be physical (e.g., take back used computers to ensure proper disposal) or financial (e.g., pay another company to accept used goods). When done successfully, the end-of-life management costs of a product are incorporated into its retail and wholesale price, shifting the related expenses from taxpayers to producers and consumers. Frequently this reduces the environmental footprint of a product, as producers are provided with an incentive to modify their product’s design to decrease the amount and toxicity of its end-of-life waste and increase ease of product disassembly, among other factors. EPDs provide an example of a Type III ecolabel. They are a globally recognized third-party verified product declaration based on the ISO 14025 standard. These declarations provide quantified environmental information on the environmental impacts for all stages of a product’s life cycle to help businesses and consumers compare the impacts of similar products. The development of EPDs are guided by Product Category Rules (PCRs), which establish the requirements of an LCA specific to a particular product group and are certified by Program Operators. Tools support Life Cycle Approaches by modelling and analyzing data over the life cycle of a product. They provide economic and environmental information used to inform decision making. Examples of commonly used tools include LCA, LCC, Material Flow Analysis (MFA), Economic Input-Output Life Cycle Assessment (EIO-LCA), Life Cycle Sustainability Analysis (LCSA), and Total Cost Accounting (TCA). One of the most prevalent tools used by governments and businesses around the world is Life Cycle Assessment (LCA). This quantitative tool measures the potential environmental impacts of a product or service throughout its entire life cycle, from the extraction of raw materials to disposal. The objective is to mitigate the environmental impact of a product or service by guiding the decision-making process.17 By identifying environmental inputs and impacts, decision makers will have more information on which to base their choices and will be more aware of the effects of these choices. LCAs can result in economic benefits by identifying and targeting reductions in energy and raw-material intensive activities. LCA, including its methodology, is guided by the ISO 14040 series of standards and includes four phases. First, the goal and scope, including the boundaries** of the study, is defined. Second, all of the inputs and outputs for a given product system throughout its life cycle are identified (often at the unit process level), compiled, and quantified in a Life Cycle Inventory (LCI). This information can be calculated through a dedicated assessment or can be taken from an existing LCI database. Third, the results of the inventory analysis are interpreted in terms of their environmental impacts (e.g., climate change, resource use, human health, ecosystem quality, freshwater use). Finally, the environmental impacts from the entire life cycle are examined to identify hot spots or compared to other products, processes or technologies to determine the best option. The results can be represented with a single score, but there is debate about the accuracy of weighting factors required to reach this. Appendix 3 contains an example of LCAs that were conducted to compare the environmental impacts of several hand-drying options (e.g, paper towel vs. blown air), which illustrate the steps required to conduct an LCA. Life Cycle Costing (LCC) is an economic tool that calculates the total cost of a product, process, or activity over its life span.18 This information can then be used to make decisions about about the design and development of a product, process, or activity. For example, the use of LCC can help quantify the costs of buying, using, maintaining, and disposing of a car. With this information, the buyer can identify which car will be cheaper throughout its entire life cycle, not just at any one stage, such as the purchase or use phase. LCC only considers internal monetary costs, which are costs passed on to the consumer. Another emerging application of LCC is in the funding of public infrastructure projects by governments. Traditional planning practices have exclusively focused on the design and construction costs of projects whereas the majority of the costs during the life cycle of the infrastructure occur during the operations and maintenance (O&M) phase. Taking into account the full life cycle costs of an infrastructure project – design, build, operation, and maintenance – will lead to a higher level of service from the infrastructure, provide more efficient use of government funds, and mitigate undue environmental impacts related to O&M. If capital and O&M budgets are not linked, savings realized at one phase may cause increased costs in another – hence the need to minimize the combined life cycle cost (capital and O&M) for an infrastructure project. By doing this, governments can deliver on infrastructure projects that align with community desires, minimize the environmental impact, and ensure the least possible economic cost over the life cycle of the infrastructure. Total Cost Accounting (TCA) is similar to LCC, except that it includes both internal and external costs. External costs are those that are borne by society and are not paid directly by the consumer.19 Environmental costs such as air or water pollution resulting from the use of the product or process fall into the category of external costs. Data is needed to use these tools. For example, to perform an LCA, LCI data is required. This is environmental data that represents the inputs and outputs for a given product system over its life cycle. Quantitative environmental and economic data are commonly used; however, qualitative and social data are also important. Life cycle data and information provides the foundation for the adoption of Life Cycle Approach concepts, programs and tools. Both quantitative and qualitative environmental, social and economic data and information is used. Sources vary from industry, academia and government and range from publicly available LCI databases to case studies and best practices. Quantitative data is most often used and is frequently guided by standards. For example, LCA requires LCI data and is guided by ISO standards. Qualitative information, such as best practices and case studies, is frequently used to inform the development of Life Cycle Approach programs or to help make decisions using LCT or LCM. There is a need for affordable, high quality data that is geographically relevant to enable robust, defensible and meaningful analysis using LCA. LCI data is the most commonly used data as it is needed to conduct an LCA of a commodity or good. The data reflects the input and output material and energy flows associated with each step in a process or production of a good or commodity. 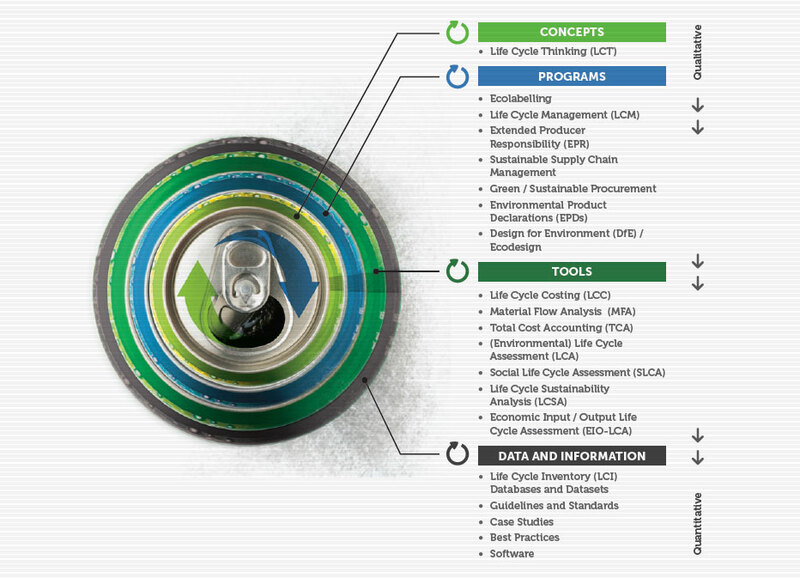 For example, an LCA of an aluminum can may involve linking numerous LCI data sets to illustrate the full life cycle impacts of the can’s production, use, and disposal (i.e., from raw material extraction, production, transportation, and use to end-of-life disposal). LCI data can be generated by the person conducting the LCA, which is often a costly and time-consuming process. Alternatively, data from multiple sources can be compiled and housed in an LCI database, allowing access to cheaper and timely data. Globally, jurisdictions are developing their own databases that are available for public and private sector use. Chapter 5 includes a further discussion on why geographically based databases are important. Life cycle data and information provides the foundation for the adoption of Life Cycle Approach concepts, programs and tools. [**] Boundaries determine what processes of the product, commodity or service being assessed are included in the scope of the study. Several types exist, including boundaries between technology and nature (e.g., what stages in the life cycle to include), geographical areas, time horizon (e.g., present vs. future impacts) and boundaries between the current life cycle and boundaries of other related systems (DANTES Project 2006).